My real life bloggy friend Christine (from Love,Life,Surf) has inspired me with her weekly roundup of bloggers and posts. In blogland there are masses of talented people with fantastic points of view. Here are some of the gems I found (and re-discovered) this week! 1. She describes herself as a “teenager completely obsessed with fashion.” Living in New York City, she blogs at You’re a Tulle and writes for Huffington Post and Chictopia. I’m old enough to be her mother, but she’s my hero; channeling her passion and building a fantastic creative work life at such a young age! Odelia Kaly is a voice that I am convinced we will be hearing a lot from in the fashion circles of the future. 2. Months ago I stubled upon a blogger named Coco J. Ginger who blogs at Courting Madness. A poet, Coco had written about a breakup that spoke to me on so many levels. I tweeted her to tell her how much I liked her work, but as the days and weeks went by I forgot her name (it happens, sadly) and thus began my new search. How excited I was to find her again (I have since begun keeping a notebook of favorite blogs). Poetry is interesting; not always easy to understand as it’s rarely spelled out clearly. It’s also tough to write (my rhymy attempt). But Courting Madness has a great following with lots of likes! Her words resonate. Especially her words about love. 3. Having recently blogged about my diet overhaul (and writing about the task of removing sugar and gluten) I received a comment by a blogger named Vinny Grette (silly pseudonym?) over at Cook Up a Story. Currently writing about nutrition for children, he (or is he a she?) suggested I read his post about stevia. I read it and loved the writing style. So often, books and blogs about nutrition are as dry as Melba toast. Vinny’s work is clever and easy to understand without being preachy. 4. One of my favorite yogis, Lisa O’Brien from lifeyum believes in feeling good and doing good. She did so this week by sharing with her readers the work and words (guest post) of Elex DiSanto Scheels from Om Frog Yoga. Alex is a mom of triplets, a yogi, and her piece about sending the kids back to school is great! To say, “I relate,” would be an understatement. 5. Describing herself on Twitter as a ” former model who loves fashion and running,” Diary of a Dashing Fashionista has put together a great post about this season’s sportswear trends. From brands I know and love (Stella to Lululemon), to brands I haven’t yet discovered (No Balls and Wellicious), there’s a great array of information and images to excite any girl’s running fashionista within. 8×10 print created by Jennifer Ramos at Made by Girl @Etsy. Check out Jen’s Made by Girl blog, too! She’s a New York City graphic designer and entrepreneur. Just fantastic! For months now I’ve been told to check out StumbleUpon, a social media searching site for bloggers, business builders and average Internet users alike. Unlike google+1, which I couldn’t quite figure out (thus never earning a place on my social media work calendar), after a quick registration and a good deal of poking around, I’ve gathered enough information to deem the site incredibly effective in its purpose; useful to those who take the stumbling plunge. Like anything new there’s a learning curve, but the best new technological tools are the ones that don’t take too much time to decipher and pack a powerful punch in what they can do for you. 1. You have to sign up. A lot of people are hesitant to put their names and information into any site for fear of over abundant junk mail or opening themselves up to some sort of evil hacking computer nightmare. Fear not. I have yet to receive anything weird in the way of emails or evil hacking nightmares and I signed up in June. 2. It’s like Google, only different. I google everything from telephone numbers to recipes to images for Mommyland (though that is changing due to the legality issues involved). But often when searching google in larger categories (like mom bloggers or running or healthy eating), the search is too broad which leads to more and more clicks, never quite getting exactly what I was looking for. 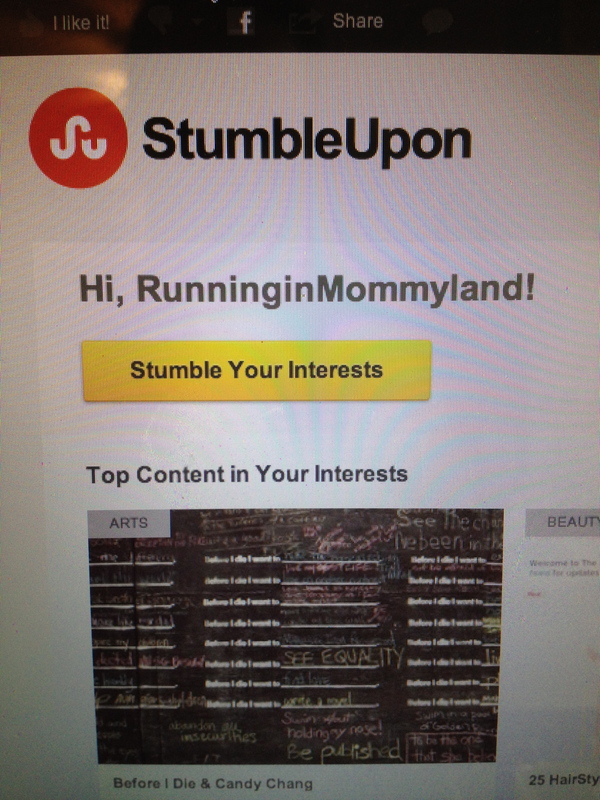 Once you’ve registered with Stumble and begin to search your interests, blogs (articles and sometimes pictures, too) will pop up onto your screen for your review. If you like what you see, you click the like button, upon which time the search engine finds more content similar in focus. As your likes grow, the site has a better idea of the content that you are searching for, thus putting more of the web at your fingertips. The introduction to things you may not have so easily found on your own is a plus. If you do not like what you’ve seen, you simply click the stumble button in the upper left hand corner and new content will come up; still under the umbrella of your category search. Is it a little “Big Brother?” Maybe. But Big Brother is inevitable with an Internet that can track our every move (I’m not saying I like it). It’s par for the course and we’re not talking about inputting social security numbers or anything (because that would be dumb, not to mention unsafe). 3. Who has time anymore? 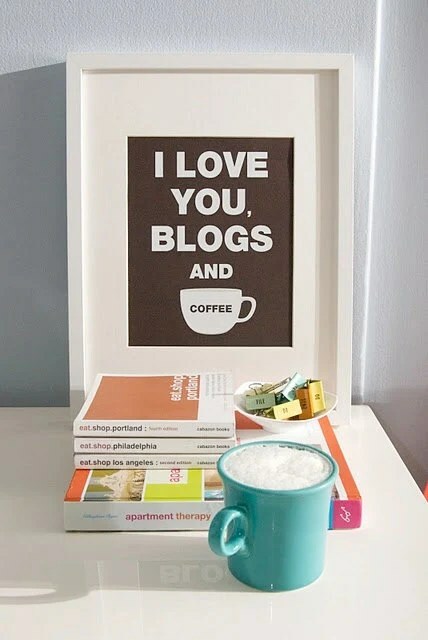 When I first started blogging I spent a ton of time reading other blogs. Bloggers come in all shapes and sizes, personalities and styles, and it takes time to find the ones who speak to you. You could (and I did) search all day, from dusk ’til dawn, but this will inevitably ensure that the rest of your life will quickly fall apart (i.e. hungry kids, messy house, children with glazed over television eyes). With StumbleUpon I’ve been able to quickly search categories of interest leading me to places I’ve never been. It’s a time saver in some ways, but in other ways it takes an extra bit of effort. For example, say you are blog reading and come across a really great post that you want to share. Once you hit the stumble icon, you will be directed to a page that asks you some pertinent information about the post. Yes it takes a minute to fill in whether or not its suitable for work, what category it falls within and maybe if you’re feeling generous, the tags that will link the post to other more specific searches (the whole point of tagging). But if you do it, even just once a day when you find really unbelievable content, you will be helping out your neighbor who may have been searching for the very same thing from in front of their own magical Mac. It’s a win/win, for the reader and the writer. 5. From the other side; how to use StumbleUpon to grow your business. After writing a blog post and submitting your work by clicking the Stumble icon (which you must add like you would a facebook or twitter link) you are adding your content to the StumbleUpon search engine giving new viewers a chance at discovering your work. A few months back I met a blogger who suggested that most of her traffic and monetary leads had been coming through the site. My curiosity was peaked at which time I signed up, but it wasn’t until yesterday that I conducted my own experiment and saw for myself the reach of the site. The number of readers who liked my work after stumbling upon me added about 10% to my overall viewer statistics for the day. I’m still small over here in Mommyland, but no intelligent blogger would balk at adding that kind of percentage to his/her daily stats. All bloggers want readers, so it’s worth the effort to submit your work after it’s been published. Worth noting, too, through Twitter I engaged with users who were seeing increased interest in their sites based on clicks through Stumble. Sarah Pardieck from Notice the Dirt was kind enough to tweet me a response to my query about the stumble experience and mentioned that she gets “quite a bit of traffic, but only stumbles certain categories of posts.” She also suggested that using lots of images up top (“above the fold”) would seemingly catch more attention and increase the likelihood that a stumbler would stay to read what you’ve got. Smart girl, that Sarah! 6. Mix it Up? In what category do you find success? To be honest, I still consider myself a newby (less than a year in) and am still working out the best way to categorize my work to get more views. Like everything social media related it takes time and patience (and work and effort) to find that magical component that helps a blogger find success among the masses. If what they say is true, that being yourself, having your own clear voice and working hard is the key to long-standing success, then continuing to find my way in regard to categorizing myself is an important piece of the puzzle. At this point I blog about running and healthy eating, motherhood and kids, and so I have submitted my work as such. This post, however, will be entered under “social media” and I’m looking forward to seeing the results in my stats. No matter which way you look at it, as a simple searcher or a calculated endeavor to grow your business, I do believe that Stumbling is a useful tool for both groups. Tell me what you think? Will you try it? Do you use StumbleUpon already? Sorry about the fuzzy and less than beautiful photo. I searched for free stock images, but my desire for a somewhat aesthetically pleasing website negates their use. As I continue to blog I am propelled deeper into the social media prism. Since then, with the addition of a facebook business page to the creation of a Twitter Profile and on to Pinterest, an unexpected brand was being developed. At first I felt silly admitting that I was building a brand, but as the management piece grew, all of the new sites needed to be connected and have an underlying component that gives the clicker an image of me. In addition to the writing and editing piece that started it all, the only way to continue to grow is to branch out even further. This is branding in action. Building something that people see and know is you. Since Pinterest, I have signed up for Google+, followed 500 Twitterers (all of whom hold real value in my areas of interest), been followed by 260 or so like-minded individuals, begun to get involved with socialmoms.net, written for GeniusMoms.com, created polls on Polldaddy, worked with Adsense in regard to monetizing, read and commented on old blogs and new, all the while continuing to return where it started in Mommyland. Upon publishing a post I must check to see that it was shared via facebook and Twitter, pin the images so that they are linked back to the blog, tweet messages to followers regarding the new post, respond to comments, go back and re-read the post on my iPhone (the single best place to check editing issues), and cycle through the other areas in the paragraph listed above. Today I must decide if I am to part ways with my personal facebook account and combine it with my slow-growing facebook page. To do this, all facebook information will need to be downloaded elsewhere before the conversion can happen. All of my friends will become fans and I’ll no longer have to post to two separate pages. It’s a smart time-saving step, but it is also a leap toward making Mommyland a cemented part of my future. Most importantly everything I do must be done without an obvious push toward tacky self promotion. It should be engaging and social, thus living up to its name. Surf the land for an afternoon and you soon see those whose heavy-duty boastfulness makes you want to click anywhere but there. It’s a tightrope fine line that must be balanced. I admit that I have had days where I have fallen into tacky territory. One must be careful. What morphed from a small blog into an unforeseen future has caught me by surprise and forced me to write this post as a template for others, while acting as proof to the naysayers that I do more than sit at the computer all day. In many ways it feels much the same as the marathon training, which started the entire of series of events. Hard work, commitment and determination must be present for you to be successful. The ride can be bumpy, so watch out for potholes and be careful to avoid injury. Pace yourself, proceed with a plan and believe that no matter the end result it’s the lessons learned along the way that make the journey so rewarding. Some days there is just not enough time to do everything that needs to be done! I drove the girls to school this morning and then had to go to a quick meeting way across town. I needed to go to the grocery store (we’re even out of peanut butter) and the bank (such Mommyland errands). Unfortunately, my ankle has been speaking to me all morning with little pings and crackles, and the swelling has not gone down as much as I’d like. I drove past the bank and the grocery store, parked in the driveway and limped to my desk to locate the number for my orthopedist’s office. He can see me Wednesday, which is great. The marathon is over 4 months away, so a few extra days off will be fine, and Dr. Kerner will give me good care and advice. Last year he gave me the go ahead to run when I had a nagging toe injury that I thought would sideline me for weeks. One shot in the toe joint and I was good to go (believe me, nothing has ever felt so good). I’ll feel better knowing he has checked over the ankle and given me the go ahead. Plus, he’s a runner, so I like to hear what he has to say on that subject, too. After the call, I psyched myself up to sit and write. The first draft I started was about all the great bloggers I’ve discovered over the past week. There is quite a community of writer’s who document all kinds of different and amazing things. I had no idea! I thought the only people blogging were Perez Hilton and my beautiful and talented friend Monica (she’s incredibly creative in so many ways)! I wanted to list the many that I’ve found, but there just isn’t enough time today. Soon, I will have to complete the list of so many inspiring people! The next draft I started, began with a concept I’d been kicking around called, To All The Boys I Loved Before. It’s a running playlist that links my memories of said boys to the music that I listened to when I, um, loved them. It actually started pretty well, until I looked at the clock. The girls are getting out of school any minute and those songs (and those boys) need clear and careful explanation. So here is a (probably) very boring post about my very busy Monday. Sometimes a mom’s got to be a mom first and a really good blogger later! You are currently browsing entries tagged with bloggers at Running in Mommyland.